Young changemakers will work for play | KaBOOM! Children intuitively understand the importance of engaging in active play, every single day. While they may not be able to rationalize the cognitive, physical, and emotional benefits of play, they know that play makes them feel happier, helps them let off steam, and gives them a chance to be with friends. In 1995, a seven-year-old girl named Ashley Brodie was instrumental in planning and fundraising for the first KaBOOM! community playground build. A resident of Livingston Manor, the housing complex in Southeast DC where the playground would be built, Ashley had been looking at the empty lot outside her window for months and sketching designs for the playground she hoped to build there. When she met KaBOOM! founder and CEO Darell Hammond and learned about plans to transform the lot into a place to play, she immediately jumped in to help, slipping fliers under neighbors’ doors and walking around to neighborhood restaurants to put donation canisters on the counters. She also personally collected $9.97 in pennies. As the build date commenced, she asked permission to stay home from school so she could help the volunteers and watch her longtime dream come to life. > Read our new children’s book inspired by Ashley's story, My Dream Playground. When Alex Griffith of Forest Hill, Md. learned that the playground at the hospital where he was born was in severe disrepair, he took it upon himself to build a new one. Adopted from Krasnoyarsk, Russia, Alex said, "Russia is part of me and this hospital is part of me. They gave me life, so I [wanted] to give back to them, to give them a fun place to play.” Alex spent six months researching the existing playground, then proposed the idea for his Eagle Scout Project. To get support, he sold candy, put on a car show, launched a letter writing campaign, went to local business meetings, and forged relationships with Rotary International and various adoption groups. 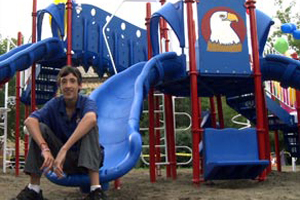 Alex designed the playground himself, incorporating the red white, and blue colors of both the Russian and American flags. Finally in August 2009, more than two years after committing to the project, Alex traveled to Krasnoyarsk to help bring the design to life, and to celebrate his 16th birthday with the grand opening of his playground. Last summer, a year before Detroit formally declared bankruptcy, a nine-year-old boy named Joshua Smith decided he wanted to help his struggling hometown. He sold lemonade and popcorn in front of his house in the hopes of raising at least $1,000 to improve the city’s parks. Not only did he end up far exceeding his fundraising goal, but his story caught the attention of Kevin Cook, an executive from playground manufacturing company Playworld Systems. The company surprised Joshua on his birthday with plans to build a $50,000 play structure at a nearby park. When Joshua heard the news, he said, “I feel really great!” And so he should! 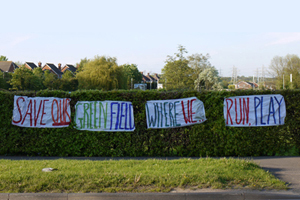 In spring of 2012, when a city council in Canterbury, UK announced plans to build housing on Kingsmead field, neighborhood kids painted enormous signs to protect their beloved playspace. Orla and Timmy, ages 10 and 11 respectively, attended a city council meeting to take a stand. Orla said: "It's not just for me and my friends but for all the people of the area who live and breathe better because there is a lovely empty green field nearby." Said Timmy: “Often in the evenings, I go to the field and play football with my dad and brother. It's very easy to stay indoors and watch TV or play computer games. Please leave our field alone." Over a year later, they are still fighting the good fight. In 2010, students at Mount Washington Elementary in Louisville, Ky. prepared a report for a class project to convince school administrators to lengthen recess time. They researched the importance of physical activity and compared their recess time—10 minutes—to that of other schools in the district. When the students presented their findings, the school council discovered that it wasn't enforcing its own wellness policy, and extended recess to meet the recommended minimum of 15 minutes. Perhaps a future class can lobby to exceed to minimum! 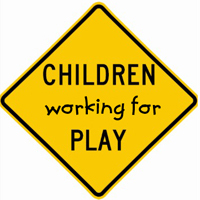 Do you know any extraordinary children who have gone the extra mile to spread the joy of play?